Ahh these sessions are some of my very favorite! The bond between mother and child/ren is so beautiful and deserves to be documented. You deserve it and so do your little ones. Really...how often do you get to be in the frame? Us moms are ALWAYS the ones behind the camera. The moms and littles seen in the slideshow here were so lovely. Even when they thought things were going a little haywire with the kids, each was able to take a deep breath, relax and enjoy the moments. We were able to capture so many lovely memories....moments that will be treasured by the mothers and children alike for years and years to come! 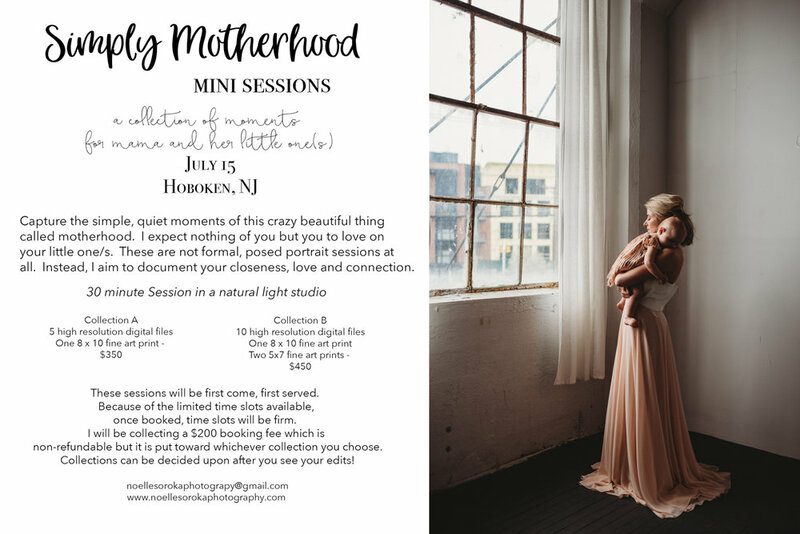 I am doing another round of these amazing mini sessions in Hoboken on July 15. Contact me to schedule...I only have a few slots left. Treat yourself, mama! I promise that you will not regret it. What are you waiting for?